Spring is the time of year when flowers start blooming, birds start singing and deep cleaning is done in homes all across the country – a tradition known as spring cleaning. An easy way to handle your spring cleaning this year is to split up chores by each major room of your home. 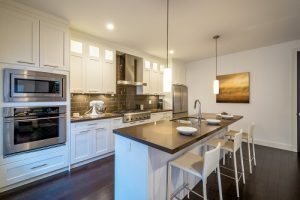 Each room requires different attention to detail, so knowing what to do will help make your journey into spring cleaning go a lot smoother and seem less daunting. In this three part series, you will learn how to tackle the kitchen, bed and bath and any living areas. The kitchen is arguably one of the dirtiest rooms of your home, coming in a close second after the bathroom. A lot of cooking and time is spent in the kitchen of most homes and, since that’s the case, a lot of messes happen as well. Two of the biggest offenders in the kitchen are the refrigerator and the oven. These get the most use and can easily become dirty if not kept up. Even when frequent cleaning is done, it’s important to deep clean your kitchen at least once a year, if not more often. Refrigerators collect stains, used containers and even smells that linger from food that’s been long gone. Many people clean their fridges on a weekly basis but deep cleaning happens much less frequently. Here are some steps to take in order to give your fridge a good cleaning this spring. This may be an obvious step but unload everything from the inside of your refrigerator, including shelves and bins, and set all of it off to the side. It’s important to start with a completely blank slate. If you’re worried about food spoiling while you clean, fill a cooler with ice and put all food that can easily spoil in it. This will be a temporary fix to keep your food from going bad. Once that’s done, use a nontoxic disinfectant to spray down the interior of your fridge and the shelves and bins you’ve set aside. If you don’t have any disinfectant to use, you can use a substitute that’s easy to make and will do the job just as well. Mix 4 tablespoons of baking soda with 4 cups of warm water and apply the mixture as you would the spray. Make sure the inside is covered in its entirety. Close the refrigerator and let the disinfectant or mixture soak a little bit. In the meantime, clean the shelves and bins using a scrub brush or sponge to remove any residue. Rinse these in the sink and use a little soap and water to get rid of any disinfectant that might be left over. If your sink is a little too small, you can use the bathtub to do your cleaning. Though you may feel a little silly, it will get the job done without creating an even bigger mess in your kitchen. Once that’s finished, do not return the shelves and bins to the fridge quite yet. Set them aside to dry instead. After that’s been taken care of, turn your attention to the fridge. Do the same thing to the inside of the refrigerator. Scrub all grime and filth away by using a brush or sponge. Obviously you won’t be able to fit the whole fridge inside your sink or tub, so pour a little warm water and dish soap into a bucket and wipe down the interior to clean any remaining disinfectant off. Let the inside dry and then return the bins and the food back to the fridge. Clean out any leftover containers and dump any food that’s past its expiration date. The same thing can be done in the freezer but make sure to wipe down the cleaner of your choice right away so it doesn’t freeze. Once it freezes, it can be very difficult to remove. Again, when returning items back to your freezer, don’t return any empty containers or expired food. The final step is another important step to take when cleaning your fridge. Condenser coils usually are forgotten about because they’re not seen often but cleaning them is vital to keep your fridge running smoothly and efficiently. Make sure to unplug the fridge before you touch the coils. You can easily clean them by vacuuming or using a cloth to remove any dust build up. The oven can be the scariest part about starting your kitchen spring cleaning. It’s no secret that it gets a lot of use and can develop deep-seated grease stains over time. Not only that, but any leftover food becomes even more burnt and caked on every time you use the oven. So it’s easy to see why most people put off cleaning it. However, in order to really commit to spring cleaning your kitchen, you can’t skip the oven. It’s important to know what type of oven you have before you start cleaning. There are a couple of different types and they each require a different method of cleaning. Self-cleaning ovens come with a feature that allows you to heat the oven to a temperature so high that it turns any built up leftovers in your oven into ash. 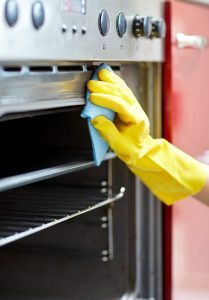 Since the self-cleaning feature does require the oven to reach extremely high temperatures, choose a time to clean your oven when the kitchen is the least active. For safety reasons, it’s especially important to be present and home during the whole time the feature is on. Also, make sure kids and pets are not in the area to prevent any injuries. Another tip is to open any windows to air out any fumes that might accumulate when using the self-cleaning cycle. Now that the area is clear and nobody is around, it’s time to prep your oven for the cleaning. Remove oven racks, foil and anything removable from the inside of your oven. Racks can be easily washed with warm soap and water. If necessary, a nontoxic cleaner can be used to get rid of tougher stains. Also, take out anything that might be stored in the drawer located right under the oven. Most people like to store cookie sheets or other small items in there. You want to take these out so they don’t get damaged by the high heat. Turning on the oven’s self-cleaning mode should lock the oven so it cannot be opened. Once the oven is locked, it will heat up to anywhere between 500° F and 900° depending on the make and model of your oven. Again, depending on your oven, the cycle can run anywhere between 2 and 6 hours. In that time period, any leftover food or grease will be burnt to a crisp and turned into ash. It’s important to note that your oven will stay hot for a while so make sure you let it cool for a couple of hours before continuing with your cleaning. After you’ve waited for the oven to cool down, sweep out any ashes inside with a brush and a dustpan. Once that’s done, take a slightly wet rag and wipe down the inside. Pay extra attention to any seals and cracks as ash could be stuck there. Though the oven just finished self-cleaning, you still want to follow up a little warm soap and water to make sure everything is nice and spotless. Most people own a standard oven but even some owners of self-cleaning ovens prefer to clean their oven a more traditional way to prevent fumes from entering their home. Cleaning a standard oven is very similar to how you would clean your fridge. Just like with a self-cleaning oven, the first step is to remove oven racks and any items you might have stored in the drawer located at the bottom of your oven. Again, you want to work with a completely blank slate. 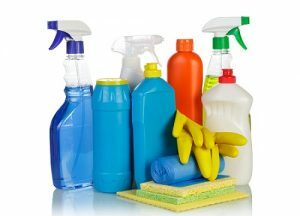 You can either choose to go with a nontoxic disinfectant to clean your oven or you can make the DIY, environmentally friendly cleaning solution mentioned above in the refrigerator section. This mixture will be able to clean the inside of your oven just as well as it did the fridge. If you choose to make your own mixture, put it in a spray bottle so you can easily apply it to the inside of your oven. After you’ve decided on your cleaning solution, go ahead and spray down your oven. For older stains and build up, make sure they are well covered by the solution. Let this sit for at least half an hour. The longer the baking soda mixture sits on stains, the more effective it will be and the easier you will be able to remove the filth. If you find that the build up in your oven is easy to chip off, proceed to the next step of cleaning. Otherwise, let the solution soak longer until you can easily remove any burnt leftovers. 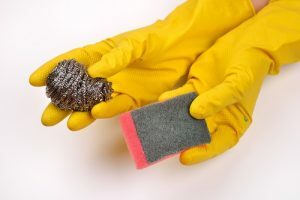 Once you’ve determined that you can easily chip off any charred areas, take a wire sponge or scourer pad and scrub those spots away. This will be the most labor intensive part but it’s important to get all burnt areas to prevent them from building up even more. Another tip is to wear gloves so you don’t get your hands dirty and to protect your fingers from the sponge or pad. After you’ve scrubbed off all of the burnt areas, take your dust pan and brush and sweep out any debris that remains. Finally, wipe down the inside of your oven with a little bit of warm soap and water. Once you’ve completed this final step, you’ll have a oven that looks and smells brand new! 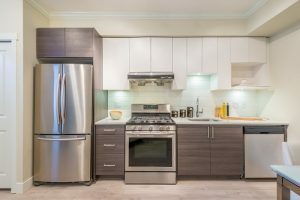 Though the oven and refrigerator require some labor to clean, once they’re done the time you put in will be well worth it. Plus, tackling two of the toughest cleaning tasks to start off your spring cleaning list will only make everything else seem like piece of cake. In part 2, we’ll cover how to clean cabinets, counters and floors to give your kitchen an overall, top to bottom deep clean!